There is no better way to create hope than by unlocking the world of education for hungry young minds. Good360, a global leader in product philanthropy and purposeful giving, has joined forces with More Than Me (MTM), a nonprofit using education as a catalyst for transformative social change for students in Liberia, in order to provide critically needed school supplies to children in one of the world’s poorest nations. 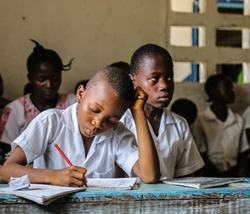 Liberia is experiencing a national emergency in its education system as a result of a 14-year civil war that ended in 2003 and the Ebola crisis in 2014. More Than Me began as a project to get girls into schools and is now an incredible movement transforming education across the country. The organization opened its More Than Me Academy for 150 girls in 2009 and reached a new milestone in 2016, launching the More Than Me Public School Network and opening 6 new schools in 6 new communities to serve 1500 students in partnership with the Ministry of Education of Liberia. For the 2017-2018 school year, MTM will operate 19 schools and will scale to 500 schools in the next 5 years, reaching over 125,000 children. Good360 is supporting the MTM mission by leveraging its donation and partner network to source school, educational and medical supplies for each of these schools. Needed product includes standard supplies like composition books, pens, pencils, but also school uniforms, desks, chairs and resources for the teaching staff. More than half (51%) of Liberian youth aged 15-24 and approximately 73% of all women and girls in Liberia are illiterate. 65% of primary school aged children are out of school. In 2013, each one of the 25,000 applicants to the University of Liberia failed the entrance exams. Only 17% of teachers have a tertiary degree-level qualification. Only 20% of students who enroll in Grade 1 make it far enough to enroll in Grade 12. A brutal 14-year civil war destroyed over 80% of the country’s schools. The 2014 Ebola crisis further weakened Liberia’s infrastructure. Good360’s mission is to transform lives by providing hope, dignity, and a sense of renewed possibility to individuals, families, and communities impacted by disasters or other challenging life circumstances who, without us, would struggle to find that hope. As the global leader in product philanthropy and purposeful giving, we partner with socially responsible companies to source highly needed goods and distribute them through our network of diverse nonprofits that support people in need. Good360 has distributed more than $9 billion in donated goods around the world, helping its network of more than 57,000 prequalified nonprofits strengthen communities and improve the lives of millions. Good360 is proud to partner with corporate donors such as Walmart, UPS, CVS Health Foundation, Nike, IKEA, Sears, Home Depot, Grainger, 3M, Mattel, Crayola, Gap, Inc., ANN INC., Williams-Sonoma, and Hilton. Good360 is a registered 501(c)(3) organization. Learn more at https://www.good360.org. More Than Me (MTM) operates a growing network of free public schools for children, ages 3 – 15, that protect the rights of every child by providing quality education programs that focus on safety, health and learning. This low cost, scalable self-sustainable model aims to affect positive change for 125,000 children by 2021. MTM’s capacity building model strengthens the ability of school leaders, teachers and parents to better serve students. MTM schools are community hubs that provide access to education, social-emotional, safety and health services that ensure MTM students and their families thrive at school and beyond. What began as a project to get girls into school is now an incredible movement transforming education in Liberia, West Africa where some of the most vulnerable communities in the world are still rebuilding after a brutal civil war followed by the Ebola epidemic. In collaboration with the Ministry of Education, MTM is leading a systems transformation in Liberia – through Partnership Schools for Liberia, an innovative partnership that brings together education providers to manage a percentage of Liberian public schools.